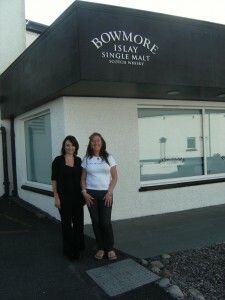 Rachel Barrie is intelligent, elegant, precise, astute, and master blender with Morrison Bowmore Distillers. One evening during the Islay & Jura Whisky Festival, I met with Rachel to talk about her job and her life. Rachel told me she studied chemistry at the University of Edinburgh, and when she did well in exams her father would give her a bottle of malt ~ An incentive to study if ever I heard one! During her last year she joined the universitys whisky society. When she left university it was rather assumed Rachel would work in the oil industry, but she took a job with the Scotch Whisky Research Institute and never looked back. The Scotch Whisky Research Institute gave her a fantastic grounding in blending. They work with spirit from all over Scotland ~ Islay, Speyside, Campbeltown, Lowlands. Rachel is from Inverurie. She now works with Morrison who own Auchentoshan (Lowland) Bowmore (Islay) and Glen Garioch (Highland). Rachel said that she is looking forward to working again with the different spirit from Scotlands distinct whisky regions. She feels it brings the work she began with the Scotch Whisky Research Institute in a full circle. I asked Rachel what was her first experience of a dram ~ she said it was when she was about 7 years old and she had earache. She was given a small hot toddy made with milk. The smell is so comforting. Contained within the husk of barley is Vanilin ~ which is also found in Mothers milk. Vanilla is one of the most desired aromas on this earth. People find it attracts and harmonises them. Away back in the day, malt whisky was found at the table in the normal way of a jug of milk. It was regarded fundamental to life as bread and water. Everyone made their own in the same way they made scones, cheese, ate fish, and caught rabbits. Whisky was just a normal part of life. Many people I have spoken with tell me that a hot, milky toddy is their first experience of whisky. In my family we used whisky for toothache, putting a drop on a bit of cloth, then holding the cloth to the afflicted tooth. To date Rachel has nosed over 100,000 samples. I asked Rachel how she takes care of herself to ensure her nosing ability is protected. She told me that she has no coffee for at least an hour before tasting. She doesnt eat really strong, intense foods. She avoids onions, garlic, anything that may obscure her senses. Rachel always tries to surround herself with natural aromas. After she stumbles out of bed in the morning she has a refreshing awakening shower. She will use a fresh natural shower gel or soap ~ helping her olfactory senses to awaken. Rachel is very focussed and continually aware of smells and aromas in the natural world around her. 90% of appreciation of whisky is on the nose. She reminds me of a gamekeeper. Gamekeepers have a focussed visual awareness of their world. They can spot a tiny bird going to its nest in a crack in a wall, they can see a deer standing in long grass, yet we only see grass. Their world is the same as ours, yet contains another dimension. Rachel Barrie is similar. She has memory and spacial awareness of the world through focus on the dimension of smell. Smell contains the memory of the world. Of all our senses, smell is most evocative to memory. Malt whisky contains the smell and memory of its past. The wood of the cask contains the smell and memory of the time and place of the tree from whence it came. It is said if you smell a dogs paw, just above its pad at the bottom of its leg you can smell the whole world. Rachel said that everyone can learn to isolate smells in nature and recognise them in a dram. Whilst one is in a garden, be aware of the herbal and floral notes, whilst cooking, be aware of cinnamon, cloves, toasted smells. At a certain level peated malt releases the same molecules as cloves. Rachel told me that malt is the most complex ingredient for distilling. Whisky is in relationship ~ the notes are created and released in relationship with the atmosphere, the wood of the cask, the malting of the barley, the elements of earth, fire, the passing of time. Lichen exists in symbiotic relationship ~ whisky can be looked at similarly. I asked Rachel to tell me about where she works ~ what is a nosing lab like? She said she works in Springburn in Glasgow. It is very quiet, the doors are locked. There are marble worktops, below which are drawers and drawers containing archive samples. There are glass beakers, measuring cylinders, different glasses. She feels like she is a conductor, using chords of flavour to create different harmonies. I said How do you set off creating a dram. What is the first step? Rachel said she doesnt have a formula. One time she maybe walking through the warehouse, shell see a cask and have a light bulb moment. She must understand the stock profile of the company ~ this means what they have available in their warehouses, and each company has a house style ~ this means the character and nature of their drams. She dials up, or dials down to broaden the range. She is aware of the economics of a situation ~ a new whisky needs to be brought to market fairly quickly. It is a balancing act. Working with the theory, the building blocks of taste and flavour, the technical aspect; but also the magic and romance, the psychology of people, yet taking into account the market forces. Whom in the industry inspires you? I asked. Rachel said she was first inspired by Sheila Burtles. Sheila Burtles created the aroma wheel for whisky, which has since gone on to be developed by Ann Noble as the wine wheel. Sheila was a tutor at the Scotch Whisky Research Institute and an inspiration to all. Rachel is also inspired by Jim Swan and Martine Nouet, both innovators in the industry. Jim has a great understanding of the science of flavour and Martine works with food flavours in relation to whisky flavours. I asked Rachel for some words of advice for Whisky for Girls ~ Have no fear! ~ What a great answer. Rachel also said ~ trust your instinct, you own your dram. There are no boundaries, feel free to make your own mind up. Wise words from the woman who is poised to awaken Bowmore from its elegant slumber of the last few years. 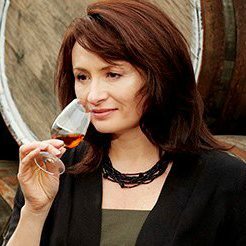 Whisky for Girls look forward to tasting the delicious drams Rachel Barrie will create from the old warehouse Bowmores of the 60s and 70s ~ casks containing the essences of Islays past.